There are two kinds of macro water drop photography. 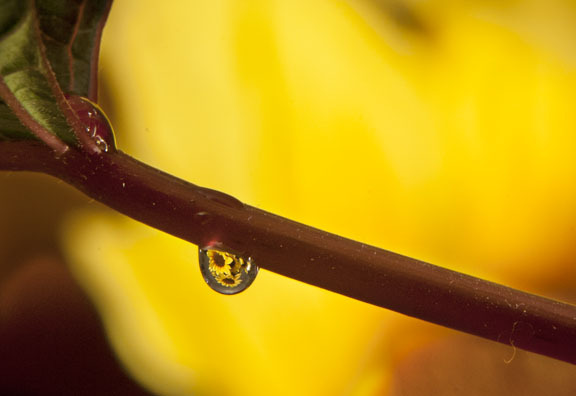 In this post you'll find out what water drop photography is all about and how you can play around with either type. Use a 100mm macro lens or longer. Light with a flash to freeze the motion and a reflector or a second flash. Get a a flow regulator from an aquarium supply store. Prepare to use patience and persistence as the exact timing for the perfect moment is challenging. Find a colorful subject for the background. 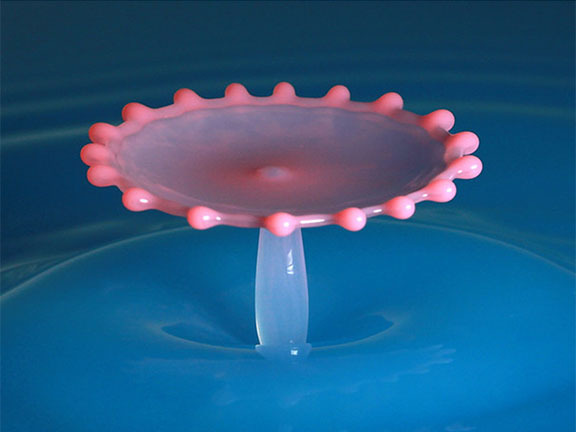 Use glycerin and water mix to form round water droplets. Get real close with a macro lens, extension tubes, or screw-on filter. Use the correct height for your tripod. I made my own first attempt to do some macro water drop photography and here is what I found out. Although I've played around with close-up photography since I was young boy, you can definitely label me as a water drop photography beginner. My self-given photography project was designed to capture macro photos of still water drops, not the freeze motion kind that have gotten so much attention in the world of macro photography lately. These photos were done as still life photos with the idea of learning a bit more about creating and lighting the water drops and their backgrounds. Controlling the background plays a big part in the amount of success you have with macro photography. It's easy to focus on your subject only and neglect to watch the background. You can move your shooting angle the smallest amount and significantly change the background and get a completely different image. Close-up photography is a specialty and some specific gear is needed, but just about any camera with a quick shutter will work. Although you can simply crop tighter with software, image quality is the best when you are able to fill your frame with your subject. that requires special optics of some kind. The focusing and sharpness challenges that come along with shooting water drops up close make the use of a tripod almost mandatory. Whether you're shooting indoors or outside, you may need additional lighting or light modifiers of some kind to get your subject and background properly illuminated. 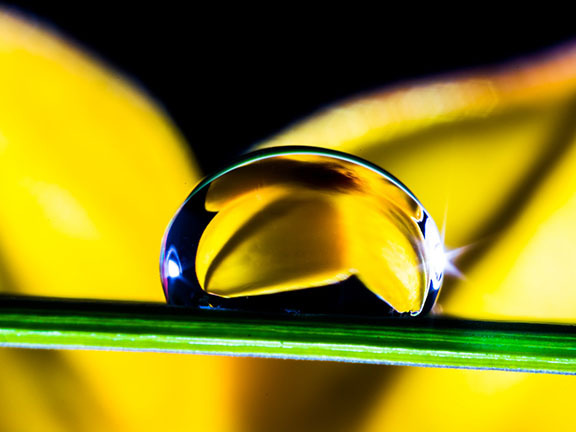 Let's start by looking at macro lens options for your water droplet photography. 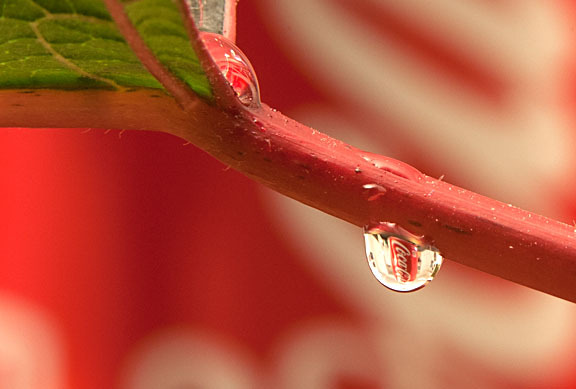 You want to use a decent macro lens for your water drop photography. Even the biggest water drops are quite small and you'll need to get in real close with a macro lens or use extension tubes like I do. If you're shooting liquid water drop splashes you'll want to use a 100mm macro lens or larger to keep your distance from the splashing liquids. I used aCanon DSLR and a set of macro extension tubes and experimented with several of my lenses to see which one would give me the best results. I set up on a billiards table which has lots of room on it and around it for props, lights, reflectors, and any other accessories I want to have handy. 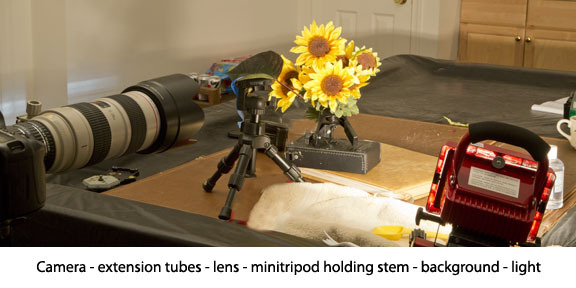 flash is the preferred method for shooting macro photography indoors. The brief but very bright light will freeze any motion from blur AND give you maximum brightness for using a small lens aperture for good depth of field. I am a lighting geek when it comes to portraits and outdoor macro shots and just about always use soft diffused light for my macro images of nature. These photos were shot inside in the basement were no natural lighting exists. When I am shooting still life and indoor macro photos I often use utility lights and bounce them off of the ceiling, a wall, or white foam core. They come as free-standing like this one pictured and also on secure light stands. 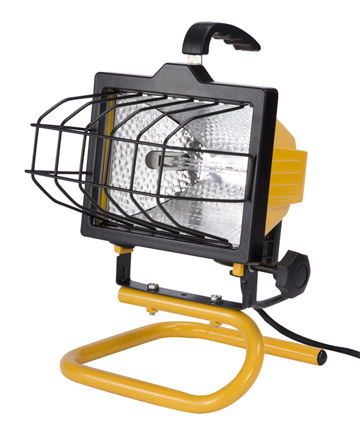 Warning: these are 250 and 500-watt lamps and get extremely hot. I like them because they are so bright and give me lots of lighting for higher apertures and good shutter speeds. This macro water drop photography was accomplished with 3 macro extension tubes and a couple of regular non-macro lenses. 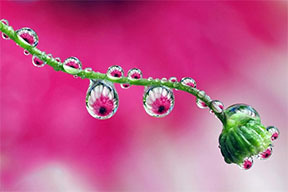 These macro photos of water drops are not true macro by definition because they don't have a 1:1 magnification factor, but they are still close-ups. The bunch of sunflowers were placed just a few inches behind this very small drop of glycerin and water. Water drops are just like glass when it comes to lighting and they act like little focusing lenses for the background. 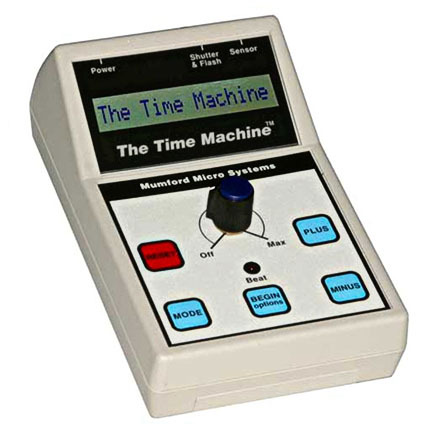 A device like this Mumford Time machine can be used for more than just water drop photography. It can also do time lapse and ballistic photography.